We are very proud to supply the greatest marine power systems brand in the world. 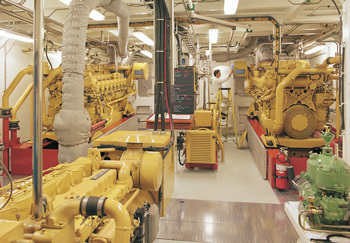 When you choose Cat® and T&E, you’ll be accessing the industry's largest and most reliable range of propulsion engines, auxiliary engines, marine generator sets, and propulsion products including azimuth thrusters, transverse thrusters, controllable pitch, and control systems. You’ll also have the confidence that the team in your corner will deliver a world-class solution that fulfills all of your needs for the life of your system—from design to installation to operation. When you partner with T&E, you’ll have 12,000 years of combined experience at your disposal, dedicated to helping you succeed every step of the way. For shipyards, naval architects, OEMs, and owners/operators, T&E Power Systems is the Pacific Northwest’s leader in providing total marine systems solutions. Click Here to view our Marine Power Products Guide and Click Here to learn more about Cat Propulsion products. As one of the largest and most experienced Caterpillar Marine dealerships in the world, you’ll receive unrivaled support regardless of your vessel’s application, whether it be fishing, tug, salvage, dredge, ferry, pleasure craft, cruise, general cargo, government, offshore or inland waterway. Before, during, and after installation, you’ll receive unmatched technical and project management assistance from our Sales and Engineering teams. We’ll provide exceptional expertise as you select, customize, install, and trial your marine system. We understand the challenges of integrating the often-conflicting demands of numerous design constraints in order to produce a safe, economic, environmentally sound and seaworthy design, and we’re here to help you succeed every step of the way. Click Here for Naval Architect Resources. As you operate your vessel, we’ll keep your systems running and at optimum efficiency, with 24/7 on-call parts/service and 24/7 parts ordering. Our marine service technicians are the best in the business and have impressive track records in Washington, Alaska, and on customer vessels throughout the world. Our Dutch Harbor location and staff is a cornerstone of our unrivaled parts and service support commitment to the Cat-powered vessels of the Northern Pacific. When you partner with T&E, our wealth of experience and support capabilities will help you minimize your life cycle costs and maximize your operating efficiencies. We’ll work closely with you to tailor the optimal mix of preventive maintenance, overhaul and warranty options, and technical support. Please browse our Cat product lines below, and contact us today to begin, or to continue, a successful partnership.